I had no occasion or person to give that to, but I didn’t need one, because the injunction to embrace life, on top of the beautiful hand-made 3D design, was enough to make me want to get it. I’ll find someone to give it to, I thought to myself. It was at once a damning indictment and a liberating release. It became the key to a new relationship with my schedule, and with my life overall. See, I’ve always thought of myself as a good time manager. I’ve carried around my brick of a Franklin-Covey planner everywhere for years, and I pride myself on spending every Sunday planning the week ahead with every appointment, every to-do, all of it. And when I do the things I’ve planned, I relish every moment I get to check things off the list. But when I don’t do the things I plan, I beat myself up. Hard. And that’s a problem, because my usual remedy for the shame is to allow myself to check things off that I only do halfway, or things that only get a cursory glance and not the deep commitment they deserve. And the result? Longer to-do lists down the road. Which I don’t finish. And then beat myself up for. Again. Until I stop making lists altogether, and my soul flushes down the toilet. “Embrace life” has me see another way out. And I share this with you because as musicians, some of us give our work only cursory glances when the going gets tough (or too easy) and schedules get crazy. “Oh, I’ll fix it in performance…I’ll just warm up in the car on the way to the bank…” and so on. Are we getting things done just so we can check off the to-do list faster, or are we doing it for the fulfillment of our dreams? 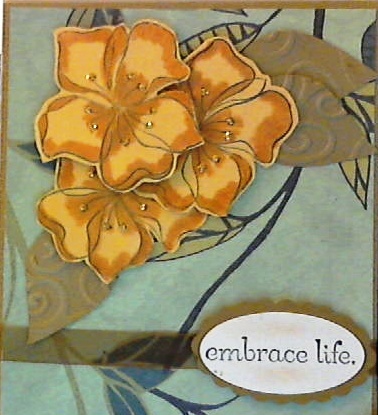 Here’s what I had to get with “Embrace life”: Dive in deeply. Accept life fully. Do things to completion. The thing that there is to do right now, do that and nothing else. Be intimate with your life tasks. Embrace every moment passionately and don’t worry about missing something. You won’t miss anything. Everything life offers is an opportunity to open up and accept what’s there to do and be. Fall into it. Don’t resist. You won’t have to worry about time; you could embrace time and not try to escape from it at every single moment. Life is not a thing to escape. The cursory glance is our attempt to escape from time. If you fall into time instead, and into the task you’re given, time will become your friend and you will end up having more of it, not less. You don’t need more time. If you say you need more time, what you really need is more depth, more commitment and attention to the thing you’re doing. (And less complaining and distraction.) What you need is a firmer embrace on life. What if, instead of to-do lists, we made depth charts? Like, how much depth of action and attention does a thing need, rather than how much time? Never tried it, but I’m curious about it now. What do you think that would look like? Whatever it looks like, it feels like we would be taking the injunction to “embrace life” pretty darn seriously.